Of all the creations of animation studio Cosgrove Hall the best loved has to be DangerMouse. First appearing on our screens in 1981, the worlds best secret agent, and his assistant Penfold the hamster, continuously thwarted the plans of the evil Baron Silas Greenback for 10 series. The cartoon paid homage to spy films and TV shows, but also to the classic black and white serials like Flash Gordon and Buck Rogers, as each story was split into several 5-10 minute episodes with cliffhanger endings. 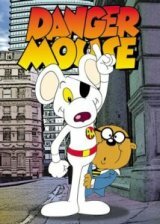 DangerMouse (voiced by David Jason) was a white mouse who wears an eye patch over his left eye. As the theme tune said, he’s the strongest, the quickest and the best secret agent in the world. Quite why Penfold (voiced by the late Terry Scott) came along on his adventures is not really clear, since all he was really very good at was getting captured, being scared and making tea, but that’s not to say we didn’t enjoy Penfold’s input. DangerMouse (or DM for short) was given his orders by Colonel K, a slightly bumbling old chinchilla (yes, I know, I always thought he was meant to be a walrus too) with a big white moustache. He’d quite often get sidetracked onto some other topic completely, much to the annoyance of DM. Once the orders were relayed DangerMouse would zip out of his post box home in his sports car, which could also fly, to go and save the day. DM’s nemesis was Baron Silas Greenback, a fat green toad with a touch of The Godfather about him. The Baron had a pet caterpillar called Nero, who quite often got accidentally squashed by the Baron’s fist when DM foiled his latest evil scheme, and two henchmen crows called Stiletto and Leatherhead. Watching the episodes again today lets you appreciate how the cartoon worked on two different levels, as it was knockabout fun for the kids, but for adults it was also full of puns and double entendres that would be wasted on most children. For example, in one episode DM and Penfold are talking about the astronomer Copernicus, which leads to Penfold making the awful pun about somebody wearing copper knickers. Of course, DM silenced Penfold with his trademark “Penfold, shush!” line. This entry is filed under TV - Cartoons	and was posted on October 3rd, 2007. You can follow any responses to this entry through the RSS 2.0 feed. You can leave a response, or trackback from your own site. I can see where you’re coming from, the glasses would certainly suggest he was a mole. There seems to be a fairly even split in opinion between hamster and mole. I think I’ll still plump for hamster since moles are black in colour, and Penfold was most definitely brown. We really need someone from Cosgrove Hall to sort this one out I think! Surely any doubt as to what Penfold is was clarified in the Copper Knickers episode when he said “This may be one small step for man, but it’s a giant leap for a hamster”. Good enough for me! Straight from the horse’s, er, I mean hamster’s, mouth. 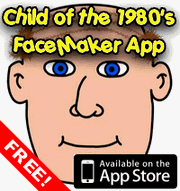 It was confirmed by Brian Cosgrove directly that Penfold is a hamster after loads of complaints to the tv quiz show “The Chase” which offered hamster as an option and mole was nowhere to be seen. Seems like finding out he’s a hamster is like finding out there’s no tooth-fairy for some people. If Brian Cosgrove says he’s a hamster then that seems pretty definite. I’m glad I was right in the first place! Let’s face it, it makes more sense for a superhero mouse to have a hamster as a sidekick than a mole, doesn’t it.